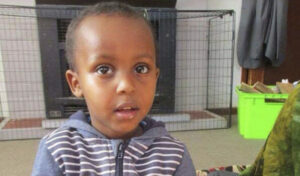 Three-year-old Mucaad Ibrahim became separated from his family in Friday's barrage of violence at a New Zealand mosque. CHRISTCHURCH, New Zealand — He spent just three years on this earth, but in some ways, a friend said, he seemed like an old soul. Before he became the youngest known victim of Christchurch’s mass shooting, 3-year-old Mucaad Ibrahim had possessed intelligence beyond his years, and an affinity for his elders. beloved little boy was dead. Each of the 50 lives lost in Friday’s senseless barrage of violence at the hands of a white supremacist has left an aching wound across this close-knit city. But the death of Mucaad, with his big brown eyes and sweet smile, has pierced with particular ferocity. Everyone began to run. Abdi thought his father had Mucaad. In the rush and the crush of people, the trio became separated. That was the last time Abdi saw his baby brother. A few minutes later, Abdifatah emerged through the arrivals gate. He and Abdi wrapped their arms around each other in a tight embrace. And then they went to wait for the release of their little brother’s body so they could lay him to rest.